Take a bowl and add sugar and ghee in it. Place this sugar bowl on stove on small burner and on low heat. After few minutes observe that sugar starts changing color but not yet fully melted. At this stage observe that sugar starts changing color and appears floating in the melted ghee. At this stage we have to lower the heat further---for this place a stand (NEYYI KAACHUKUNE CHATRAM) on the stand above the burner and place the sugar bowl on this elevated stand--- as the flame is away from the bowl heat would be less. Now allow the sugar to melt completely stirring with a spoon. When sugar is completely melted observe that the syrup turns into a nice caramel color. 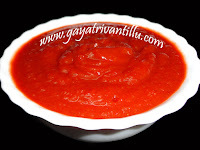 Immediately transfer the syrup along with ghee into a plate and allow it to harden. 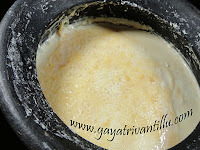 Once the syrup is hardened tilt the plate and take away the ghee—observe that the entire ghee comes out. Allow the caramelized hardened syrup to cool completely. Take this sugar slab into a zip lock bag and cover. Take a rolling pin and crush the hardened caramelized sugar into bite sized chunks. Use this prepared butterscotch in making butterscotch ice cream or use as topping on any ice creams. Use a handled bowl for easy handling. Use small burner in your gas stove and cook on low flame only. Sugar burns quickly and over caramelized sugar tastes bitter. So after cooking for few minutes reduce the heat of the flame further by increasing the height of the bowl from flame by placing a stand above the existing stand. Following this method gives the right color and taste to the caramelized sugar. Ghee gives the butterscotch flavor to the caramelized sugar. But observe that, the entire ghee comes out once the butterscotch is made---just the flavor remains. Take the caramelized sugar slab in a zip lock bag and cover it. Then beat it with a rolling pin to break into medium sized chunks. Then roll the chunky caramelized sugar with rolling pin to break further into bite sized butterscotch. Do not use grinder to make the butterscotch out of the caramelized sugar slab as it would turn the entire thing into fine powder. To get good bite sized pieces transfer the contents from the zip lock bag into a big holed strainer and sieve to remove the fine powdery or very tiny bits of caramelized sugar. Use these tiny bits to enhance flavor in ice creams. 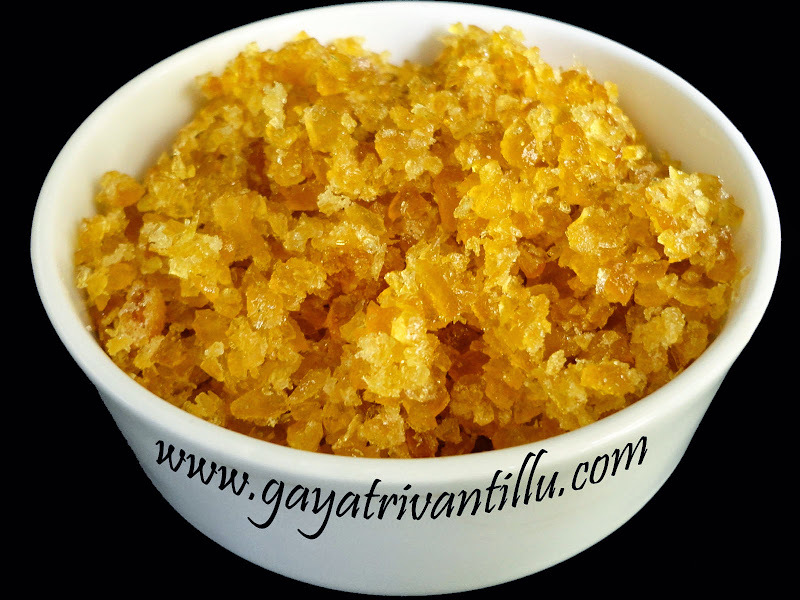 Butterscotch or ghee flavored caramelized sugar pieces can be used in making butterscotch ice cream or may be used as topping on any ice creams.